So, you may remember that I got a grill / smoker for Christmas. Technically, I got a picture of the grill / smoker ... but that is a story of its own. And ... eventually I got the actual grill and the actual smoker box. As a result of this gift, I've gotten into smoking meats. I have started looking at different Barbecue / Smoker forums because ... well ... because I now have a smoker. One thing I've noticed is that there is some people are somewhat snobbish on equipment. Different types of fanatics can be really anti-every-other-type-of-smoker. If you believe your primary heat / smoke source has to be real wood, you really believe it. 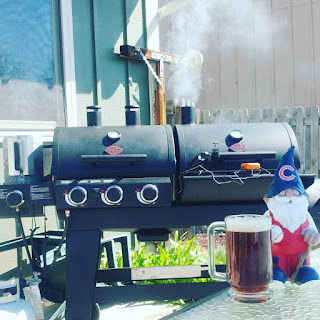 If you love your pellet smoker ... you really love your pellet smoker. Offset smokers are the only real way to smoke. If you're not a stick-burner, you're not really smoking. Kettle grills are way better than anything else. To be fair, it seems to be a minority of snobs on the forum, but they do seem to be a somewhat "vocal". It is very similar to the snobbery of All Grain Brewers have about Extract Brewers. And don't get me started on the whole "Mr. Beer" discussions. This sort of thing probably happens for all types of hobbies. In the barbecue / smoking community, as far as I can tell, electric smokers are the most looked-down-upon. As far as I'm concerned ... this is ridiculous. RIDICULOUS. The person I talk the most to about smoking is one of my co-workers. He owns an electric smoker, and quite frankly, I am usually a little jealous of him. I love firing up the charcoal and putting in wood chunks and managing the fire box ... for the first few hours. Eventually it becomes a chore to keep an eye on the heat of the cooking chamber. Depending on what is going on with the family, there are weekends that I would love to fire up the smoker but can't because I need to be available to taxi people around. My co-worker doesn't really have these issue. He sets the electric smoker and checks it from time to time, but it is pretty much hands-off . If he had to leave the smoker unattended for an hour or two, he could. I'm not going to go out and get an electric smoker any time soon. But, at some point I can see myself adding one to my smoking tool set. The Electric Smoker Guy reached out to me recently on my Contact Me form. He came across one of my articles, and thought it might make sense to do some cross-linking across sites. I agreed. I almost always agree. But the Electric Smoker Guy is an amazing website. Anything you could ever want to know about electric smokers appears to be on this site. What is the best smoker? covered. What if you are on a budget? check. What are some good options for digital smokers? included. He even has a blog on the site. Makes my little blog look sort of dumb.